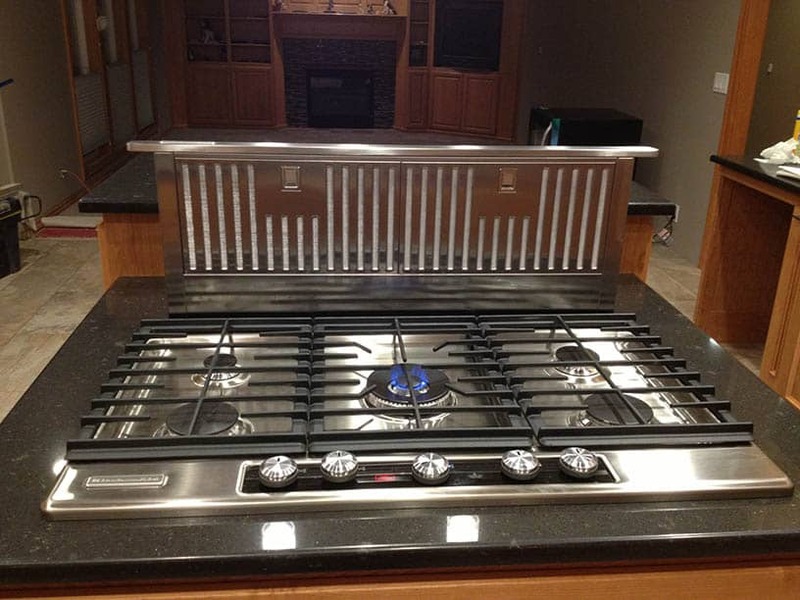 Safety is a primary consideration for the placement of the range/cooktop. There should be 24” of clearance between the cooking surface and a protected surface above, or 30” to an unprotected surface. A microwave hood combination appliance may be lower than the 24” dimension as dictated by the manufacturer’s specifications. The back of the cooking surface also should be protected with a flame retardant backsplash or by a countertop extension in the case of a peninsula or island location. The cooking surface must not be placed below an operable window. For an open-ended kitchen configuration, at least 9” of counter space is required on one side of the cooking surface top and 15” on the other. When the cooking surface top is located near an end wall or tall cabinet, at least 9” of clearance is required between the cooking surface and the wall or tall cabinet. 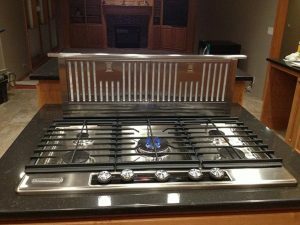 The cooktop can be as close as 3” to a wall if it is protected with a flame-retardant surfacing, although it is not recommended to get this close, and 15” has been allowed on the other side of the cooking surface. Ovens that are separate from the cooktop require additional space. There must be at least 15” of landing space next to or above the oven if the oven door opens into a primary traffic pattern. A 15” landing space, which is no more than 48” across from the oven, is acceptable if the oven door does not open into a traffic area. For a kitchen with a microwave, at least 15” of landing space should be provided above, below, or adjacent to the microwave unit. Locate the microwave oven after considering the user’s height and abilities. The ideal location for the bottom of the microwave is 3” below the principle user’s shoulder but not more than 54” above the floor.